Car parts retailer Halfords has expanded into the car servicing and repair sector by buying Nationwide Autocentres in a £73.2m deal. 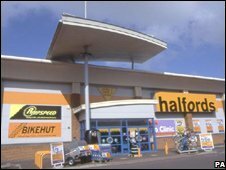 The takeover will lead to Nationwide's 224 outlets being rebranded as Halfords Autocentres. Halfords says it then plans to open another 200 centres, creating more than 1,000 new jobs. Nationwide currently employs 900 people and has been owned by the private equity firm Phoenix since 2006. "Our expansion into the adjacent car servicing and repair market is an exciting and logical move for Halfords," said Halfords chief executive, David Wild. "Car maintenance is a large and highly attractive sector where there is increasing demand from motorists for reliable service at affordable prices. Nationwide is a high quality business and represents an opportunity for significant growth." Halfords said it estimated that the car maintenance market was worth £9bn, with about 33 million cars needing regular servicing and repairs. Following news of the deal, shares in Halfords jumped 38.5 pence, nearly 10%, to 430.2p in morning trade.